The business world is changing; the demand for sustainable products is growing in Europe and CSR is becoming a key factor in business strategies. Exporters in developing countries who are aware of the latest CSR guidelines and trends can create a better competitive position for their business and products. In 2011 CBI (centre for the promotion of imports from developing countries, Netherlands) in collaboration with FICCI initiated a capacity building programme on CSR in India. In this programme Indian consultants were trained to assist companies supplying to the EU market to integrate CSR into their business models. 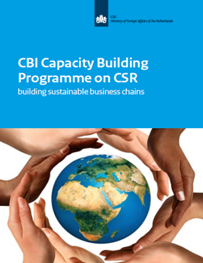 This publication documents the process of mainstreaming CSR in few selected companies. The book was released during the CBI training assessment on October 18, 2012.